Retail Fraud First Degree: If the value of the merchandise is $1,000.00 or more, the punishment is up to 5 years in prison and/or fine up to $10,000.00, or 3 times the value of merchandise. Retail Fraud Second Degree: If the value of the merchandise is $200 but under $1,000.00, the punishment is up to 2 years in prison and/or fine up to $2,000.00, or 3 times the value of merchandise. Retail Fraud Third Degree: If the value of the merchandise is under $200, the punishment is up to 93 years in jail and/or fine up to $500.00, or 3 times the value of merchandise. What are the chances of getting a retail fraud dismissed? The very nature of a crime that contains the term ‘fraud”’ is a frightening proposition that can be devastating. In my opinion, most offenses which are charged as retail fraud in the third degree would be more appropriately called ‘petty theft’. Nonetheless, any criminal offense should be taken very seriously. Dismissal of the charge upon compliance! Although not guaranteed, we have achieved this result for those with no criminal record as well as those with an old record or for an unrelated criminal matter. Retail fraud first of second degree: Criminal cases where an offender is charged with first or second degree retail fraud are handled differently than retail fraud third degree cases. Fortunately, they are often manageable and jail-time is rarely, if ever, imposed. In addition, the charges are subject to plea bargaining with meaningful reductions. Provided the offender does not have a prior felony record, getting a felony retail fraud charge reduced to a misdemeanor is within reach of realistic outcomes based upon our experience in Macomb County and the 42-1 District Court. A dismissal as I have described for a first offender charged with retail fraud third degree does not come as smoothly when the charges are first or second degree retail fraud unless the offender qualifies for HYTA status (age 17 to 23). How does a person commit the offense of retail fraud (shoplifting)? Simply put, retail fraud is stealing. Retail fraud is a crime of opportunity. The offender looks for an opportunity to conceal an item of merchandise, change a price or attempt to defeat the u-scan. Sometimes, other individuals are complicit and may also face charges if assistance was provided in commission of a crime. Large retail stores have a vested interest in deterring theft and preventing it where possible. Meijer stores are no exception and employ trained loss prevention personnel and utilize security cameras at all of their locations in Macomb County (Macomb Township, Chesterfield Township, Sterling Heights). The first indication that a person will know that he or she has been accused of retail fraud occurs upon being confronted by a loss prevention officer. At some point during the confrontation, the Macomb County Sheriff Department will be involved to conduct further interrogation and be responsible for charging the individual. An offender may be arrested on the spot, issued a ticket or notified of the charges at a later date. A person in this predicament should not hesitate to obtain a lawyer with experience handling retail fraud cases in the 42-1 District Court. Washington Township utilizes the Macomb County Sheriff Department or the Michigan State Police for its all law enforcement. What should I do if I am charged, or think I will be charged, with retail fraud? 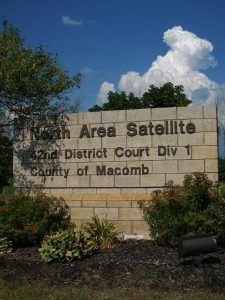 After a person has been arrested or issued a ticket for retail fraud in Washington Township, the case with track through the 42-1 District Court located in the northern Macomb County suburb of Romeo. If arrested, a bond may need to be posted before an individual is released from jail at the Macomb County Sheriff Department. If a ticket is issued (which is much preferable to the prospect of an arrest), the accused party will be asked to appear at court (usually within 10 days). If the charges are something other than retail fraud in the third degree, it may take up to 30 days before notification of criminal charges is provided. In the worst case scenario, the accused party may be held in jail while the officer seeks authorization of criminal charges. In every scenario that I have described, the accused party should retain a lawyer to discuss all legal options. Also while a retail fraud is pending and before any finding of wrongdoing or guilt, the accused party may also receive a civil demand (usually for $200.00) from an attorney to compensate the retail establishment for loss prevention services. We recommend that an attorney be consulted before making payment and to discuss how this may, or may not, be beneficial later in the proceedings. The 42-1 District Court: Our attorneys are very familiar with the customs and practices of this Court. We have found that most retail fraud cases can be resolved in one or two appearances in the 42-1 District Court. Judge LeDuc is the longtime presiding Judge at the 42-1 District Court and is known for trying to figure out the root of somebody’s criminal behavior and often engages litigants to be introspective. Again our offenders have run the gambit from juveniles to senior citizens from all walks of life and financial circumstances. Judge LeDuc likes to rule out drugs as an underlying problem and may impose drug testing on offenders even for those that deny a history of substance abuse. Pretrial conference: Following the arraignment phase of a criminal case, the pretrial conference will be the first time opportunity that a person will appear at the courthouse with an attorney. At this stage, an attorney will engage in negotiations with the prosecutor and a summary of the negotiations will be formally presented in the courtroom before the Judge. A plea bargain is not a done deal until the judge says so. In Judge LeDuc’s courtroom, an attorney may be asked to ‘do some convincing’ before he ultimately decides to accept a plea bargain for leniency. In almost every retail fraud case charged in the third degree with no prior record arising out of Meijer, a favorable plea bargain can be achieved to keep our client’s record clean by negotiating a plea pursuant to either MCL 771.1 or HYTA. Probation Interview: Judge LeDuc will refer most offenders to the probation department for a pre-sentence report following the plea proceedings. At the time of sentencing, Judge LeDuc will consider the probation department’s report as well as any statements by the attorney and accused party. Results: We have found that a typical positive sentence in the 42-1 District court means a dismissal upon successful completion of probation. Whenever drugs or mental health are a concern, the court there may order probationary conditions to include drug/alcohol testing and/or counseling). Judge LeDuc will give a person a break but is not likely to be sympathetic for someone that violates a term of probation (fails a drug/alcohol test, misses a test, is charged with another crime). A violation of probation can have harsh consequences such as losing a deal to get the charge dismissed and incarceration. Retail fraud cases are consistently listed on criminal dockets as one of the most prevalent misdemeanors in the district courts and are directly within Abdo Law’s wheelhouse of legal services. By and large these cases resolve favorably and predictably for our clients. As I have described, clients can earn a dismissal by complying with reasonable conditions of probation. However, we warn all of our clients that any misconduct during the pendency of the case or after being placed on probation is a recipe for disastrous consequences. Our Firm practices extensively in the 42-1 District Court, located in Romeo, with business in that court location just about every week of the year. With proper representation, a retail fraud case arising out of conduct at the Meijer store in Washington Township can almost always manageable. Don’t drag your feet when it comes to criminal problems! We offer same day appointments, can see about getting your arraignment waived and provide you with a sound legal plan.